This is the first in a collection of stories about living in the flatlands of Wheatland, Pennsylvania, where a diverse community once thrived but no longer exists. One of the fiercest tornadoes in history wiped away this tiny village in 1985, but it did not erase my memories of the place where I lived as a child in the late 1940s. In order to write about my knowledge of Wheatland in those post-WWII days, it is necessary to also include the history of my family, as the memories are intertwined. With these stories and those that others have sent me, I hope we can preserve some of Wheatland’s history before the memories are gone forever. If you, too, lived in the flatland of Wheatland, Pennsylvania, before its destruction, I hope you will please contribute to this account. To describe my family’s presence in Wheatland in the 1940s, I must begin with my immigrant grandfather, Augustine Anghel. Enticed by flyers advertising jobs in U.S. steel mills and on railroads, he came to America in 1906 with a plan to earn and save money, then return to his home in Romania to continue working on his sheep farm. Instead, he stayed in the U.S. for the rest of his life (for which I am most grateful! ), only returning to Romania to bring my grandmother to the “New World.” They had two children, my father (1908) and my uncle (1910). After my grandparents’ eventual divorce, my grandfather settled in western Pennsylvania, where he found comfort in the community of the many other European immigrants, as well as in the area’s lush green rolling hills so much like his native Transylvania. In the spring of 1945, after almost a year of Army training and five months before WWII ended, my father, August Angel, was sent to Germany to serve as a member of the Counter Intelligence Corps (CIC) Detachment. My father had bought an old abandoned subdivision. Lots measuring only 25 feet wide had been laid out for small houses for steel mill factory workers. However, because of the 1929 Depression, the building of factories in Wheatland was no longer feasible and the real estate company declared bankruptcy. My father, a believer in owning land, bought the entire tract [75 acres] that included a good section of Wheatland. For a while, my mother shared living quarters with my grandfather’s Romanian friends, but she soon tired of that arrangement. She had saved enough money from her wartime allotment and part of my father’s military income to purchase a two-story wood frame house on Third Street. She paid $3,000 for the house, which had running water, electricity, and an outhouse. Third Street, Wheatland, PA, c. 1946. August Angel with cow. My earliest memories are of the Third Street house and that of my father returning from two years as a soldier, wearing his dark olive green Army uniform and carrying a huge stuffed duffel bag of the same color on his shoulder. My mother, brother and I were in the house anxiously watching for him to appear on the narrow sidewalk that led to our side porch. When we heard a familiar whistle – a certain melodic phrase that I can still hear today – we knew he was home. Wheatland may have been a very small town (population 1,421 in 1940) but it did have a proper annual Memorial Day parade. On April 5, 1946, a month after my father’s return, The Sharon Herald printed a front-page story about my father’s participation in CIC’s capture of a Nazi leader while in Germany. From then on my dad was considered a local war hero. For several years afterward, he was invited to tell of his wartime activities before various civic organizations and to join the leaders of Wheatland’s Memorial Day parade. The parade was complete with majorettes and a marching band, which were probably from Farrell High School since Wheatland had no high school. Also included were lines of school children, myself among them, from the Wheatland Elementary School, dressed in our Sunday best and following behind our respective teachers. The procession ended at the American Legion (#432) Home, where Dad and others gave patriotic speeches on the porch. I recall that the Home was located on the top of a steep hillside and we would join other townspeople gathered below to listen to the speech. The frame building had several floors filled with lots of old furniture that my brother and I loved to explore while our dad called out the numbers at the Legion’s weekly Bingo games. It seemed to us children as if we were standing for hours as we waited for the speeches and ceremonies to end. Then the best part came! We were rewarded with Dixie Cups of cool, creamy ice cream that we heartily dug into with our tiny wooden spoons. August Angel leading the Wheatland, PA, Memorial Day parade, 1947. Band and majorettes in the Wheatland, PA, Memorial Day parade, 1947. First and second grade children led by Mrs. Lloyd and Miss Patton in the Wheatland, PA, Memorial Day parade, 1947. Mike Angel (in short pants), Ann Angel (far right) with cousins and friends, enjoying Dixie Cup ice cream after the Wheatland, PA, Memorial Day parade, 1947. American Legion Home where speeches were given at end of the Wheatland, PA, Memorial Day parade, 1947. Flooded house, 199 Third Street, Wheatland, PA. May 1946. As delighted as my parents were in owning a home, they were to find out that its location near the Shenango River was a problem. 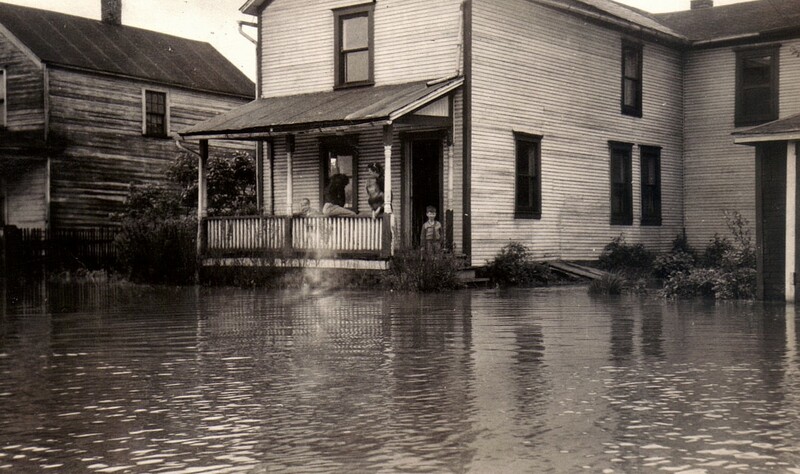 When the river overflowed its banks in the Spring of 1946 and flooded a wide area that included our house. To us kids, living in the middle of a temporary lake was quite an adventure. But to my parents it was time to move to higher ground (and to a smaller house with lower taxes), that is, Second Street. The house was sold to the Splitstones, with whom my family became friends. My name is Tom Hoovler and have I got a story for you! 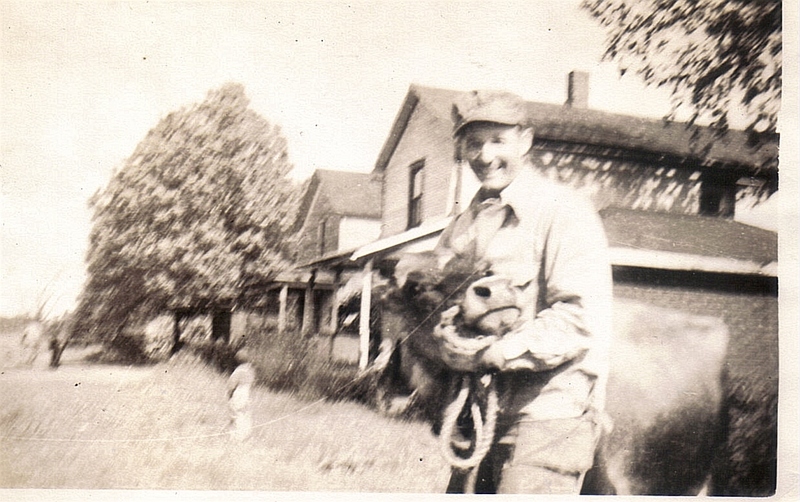 I was reading through some of the stories on your blog recently and became interested in your brief side notes about your grandfather’s farm on 3rd Street in Wheatland, Pa. Your short but telling descriptions led me to one interesting but tentative conclusion, but I needed to call my mother in order to verify it. She had always told us that her father had purchased his house at 199 3rd St. from a family named Angel. After discussing it with her, I discovered that, apparently, it was your family. Her name in those days was Agnes Audrene Splitstone and her father’s name was George. On top of it all, she says she knew you from the days that you lived on 2nd street, even though you were a few years younger than her…. I live near Buffalo, NY, now. But I lived in that house at 199 3rd St for the first three years of my life. My parents lived in that house with my grandparents for a few years after they got married. We moved to Farrell and I graduated from FHS in ’76. But I have very fond memories about that house and that property. In my growing years, I probably spent more time there than I actually did at the house I called home up over the hill in Farrell. My grandmother died in 1970 and my grandfather went into a nursing home a couple of years later. That was when the house was sold off, and we lost track of it. Eventually, the house, as well as the entire Wheatland flats were totally destroyed in the massive tornado of 1985. Everything south of Broadway was re-zoned light industrial afterward and it was truly the end of an era. [My grandparents’ house flooded] at least twice that I’m aware of, and maybe more. My mom has a photo of herself pregnant with me, sitting on the porch surrounded by water, so that would have been ’58. I only saw one of them and that was when I was four, in ’63. And that was definitely the very last time since the [Sharpsville] dam went into full operation a couple of years later. When I was living down there, and even for a few years afterward, we used to go up and watch the parade on Memorial Day. I can remember my mother and Aunt Louise used to decorate my tricycle with red, white, and blue crepe paper. Then, we’d walk up Church St., past the old church and across all the railroad tracks to get to Broadway, where the parade would be. Great memories. There was indeed something about living on Third Street, Wheatland, Pennsylvania, that made for happy memories. Maybe it was the post-WWII relief and hope for a better life that we children could sense in our parents. And maybe it was the semi-rural setting that allowed us to play in the surrounding fields and on the unpaved streets of this small town freely and safely, without a care in the world. Ann you should be proud of the work you have done with this blog.I look forward to it. Thanks, John, for your good words about the site. I enjoy recording and sharing these memories. Positive feedback such as your comment keeps me going!